At home, we limit the sugared and processed food in our house. Soft drinks only appear at parties, potato chips are never bought and cookies are usually home made. But on vacation, we relax a little, especially when traveling in a unique place. Don’t you think eating the local food is part of the cultural experience, even if it’s not necessarily good for you? I used to think the U.S. had all the choices, but in South Africa, my kids were overwhelmed and excited by the variety of potato chip flavors they’d never heard of or sampled before. The few times we stopped at a petrol station looking for a snack, they searched for the new and different. There were Korma Curry potato chips, Caribbean Onion and Balsamic Vinegar, Thai Sweet Chili, Beef and Biltong flavored potato chips and even Sweet Chili flavored Doritos. We each chose a bag and shared tastes, some preferring the more spicy chips, others the sweet. Although pineapple Fanta was the kids’ favorite choice to wash down the salty chips, they also enjoyed orange and grape Fanta as well as Grapetisers and Appletisers, just juice and carbonation, no added sugar. And of course we had to try the biltong. Similar to beef jerky, biltong is strips of meat that have been marinated or seasoned and then cured and dried. It is sold in small packages in grocery stores and convenience stores or you can buy it shredded at the mall or at the butchery where it is sold by weight. 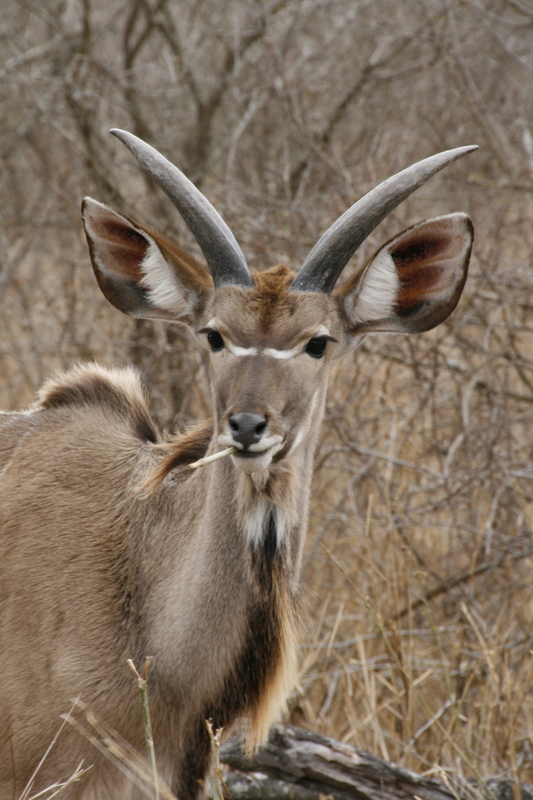 You can eat beef or kudu, ostrich or springbok, eland or gemsbok. The thickness and flavor of the biltong varies, depending on the meat, the cut and its preparation. We tried biltong a few times. In Lady Grey, we bought beef biltong from a butchery, where the butcher filled a small brown paper bag with shredded pieces cut from a big slab of beef hanging from the ceiling. We bought packaged kudu and springbok biltong in Kruger National Park. I winced as I tried it, thinking of the kudu we’d just seen running by the side of the road. If you can’t make it to South Africa and really want to try out biltong, try making it yourself (there are plenty of recipes online) or check out the website www.southafricanfood.us. Based in North Carolina, this company imports a few South African items for sale in the U.S. including biltong and Appletisers. 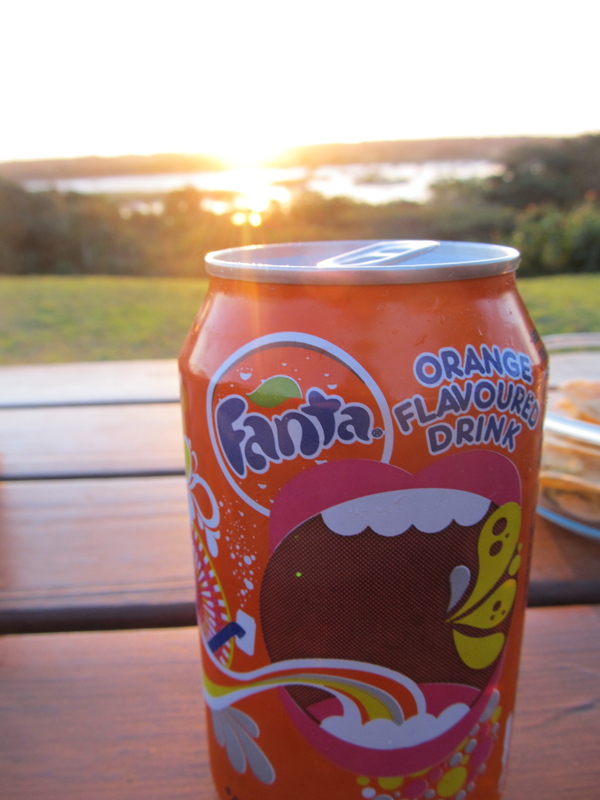 Fanta photo by Tommy Taft. Agree about the potato chip flavors. Here in Cairo they have one that is lime-and-red-pepper flavored. Kind of disgusting, but definitely unique! Here in the U.S., I’ve only seen sour cream and onion, salt and vinegar and barbecue flavored potato chips, but I’ve heard there are more flavors in other parts of the U.S. and the world, such as China, India and even Canada.